Lebanon, OH — The richest race of the season thus far at Miami Valley Raceway, the $37,500 championship of the Claim To Fame series for $30,000 claimers, produced unexpected results when three longshots with outside post positions completed the trifecta and lit up the tote board. J M Jet Set (Dan Noble) went gate-to-wire in 1:51.4 at 22-1 odds followed at the finish by 20-1 Swapportunity (Mike Oosting) and 38-1 IYQ YQR (Chris Page). The win mutuel was $46.80, the $2 exacta paid $917.60 and the 50-cent trifecta returned a whopping $3,964.30. J M Jet Set led a host of long shots to score in the Claim To Fame Series Final. Conrad Photo. Despite drawing post seven, Noble was intent on controlling the championship tilt—zooming off the gate and crossing over to the pylons early in the mile. Following a :26.2 opening panel, J M Jet Set was throttled back to a :55 halfway clocking before tripping the third beam in 1:23. The 9-year-old Jereme’s Jet gelding coasted home an open lengths winner for his 35th career triumph, missing his lifetime best time by just two-fifths of a second. 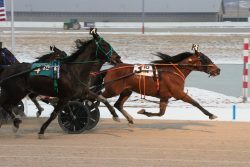 A pair of Open trots were co-featured on Sunday’s (Feb. 10) matinee. 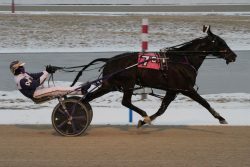 Monopoly Blue Chip took the co-featured Open I at Miami Valley Sunday. Conrad Photo.